The programs listed below are available for Putnam and Dutchess counties. Please inquire for more specific details, speaking fees and scheduling. With 30 different programs to choose from, fees are quite affordable, scheduling is fairly flexible. *Sometimes, depending on content and commute distance, programs that total 30 minutes or less in length are sometimes free. GC002- TIME MANAGEMENT FOR PARENTS: This program, designed particularly for parents, will outline many hints for setting up schedules which make sense for everyone in the family. The program is also set up to help both parents and children become better prepared for deadlines and relieve stress due to not feeling ready and/or punctual. **New!! GC003- LIFESTYLE TRANSITIONS: This new program offers an extensive outlook over the many things people often find themselves desiring to change in their lives. The purpose of this program is to allow attendees to map out an overall plan of action for transitioning into a more improved, healthier lifestyle. Changes discussed include how to shop more wisely for healthier foods, cleaning products and toiletries without falling to the potential scams of coupons, improving the air quality of a residence, learning the basics of Feng Shui and finding the most suitable ideas for recreational activities to keep in shape without becoming bored. 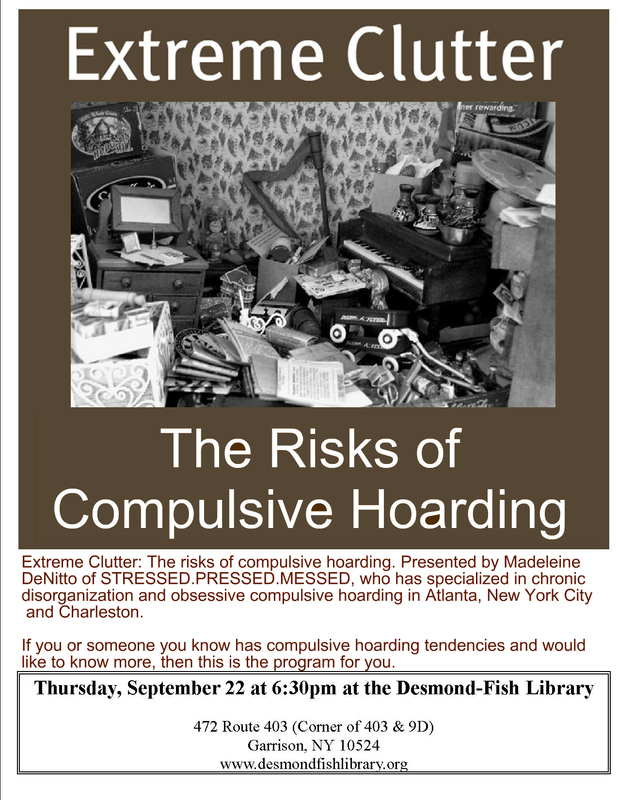 GC004- COMPULSIVE HOARDING- KNOWING THE FACTS: This in-depth program discusses the preventative measures for avoiding the risks of severe hoarding by understanding the deep psychology behind this serious subject. 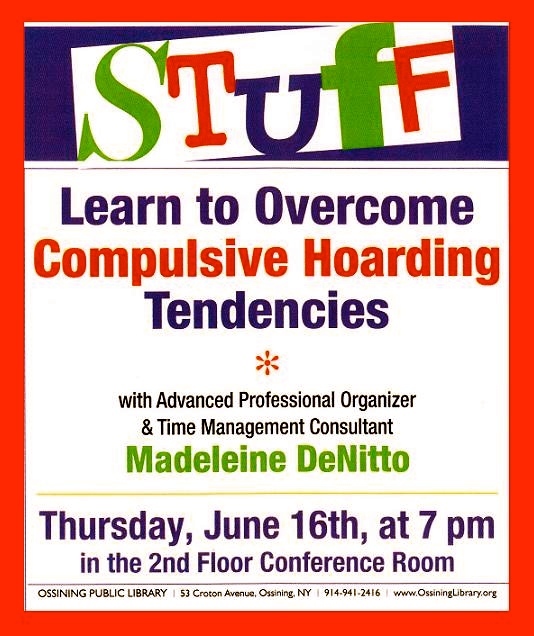 Attendees will learn important facts and statistics, understand the risks and determine the differences between collecting and hoarding tendencies. 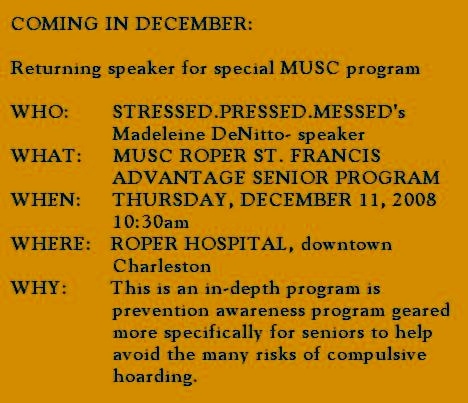 Note: This program is customized according to audience. Please determine request by General Audience or Professionals, as this program is offered to both. GC005- GREEN CLEANING- TOXIC FREE CLEANING BASICS: Dealing with anything from cobwebs to clutter, this cleaning workshop offers recommendations for the use of healthy products and how to clean in an organized, productive process. Attendees will learn how to clean up and clear out the dirt, dust and clutter and have that fresh beginning you have hoped for become a reality. 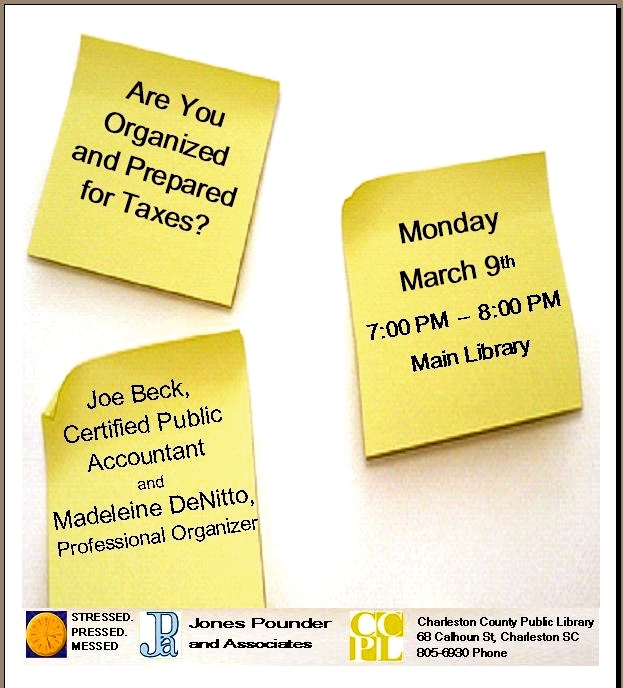 The discussion will include how to create plans that work with action that is not overwhelming on a budget. 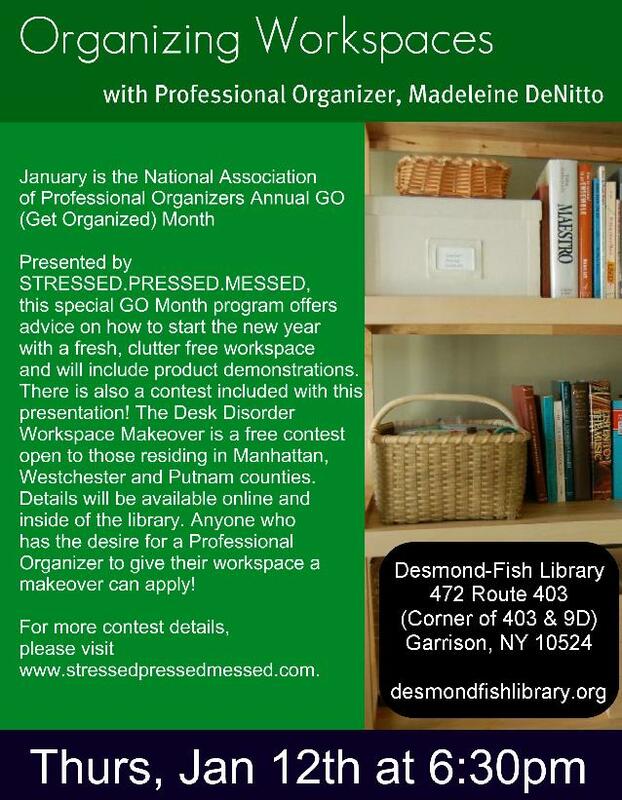 GC006- BASIC ORGANIZING FOR THE STRICT BUDGET: Created specifically for those wanting to develop or maintain organization at work or at home while staying within a tight budget, this program relates to case studies of how others with strict budgets afforded organizing services and storage items, etc. This program demonstrates samples of storage items and filing options, complete with purchase locations and costs, while also holding discussion as to how the high-end market versus the lower end by cost and quality comparisons. 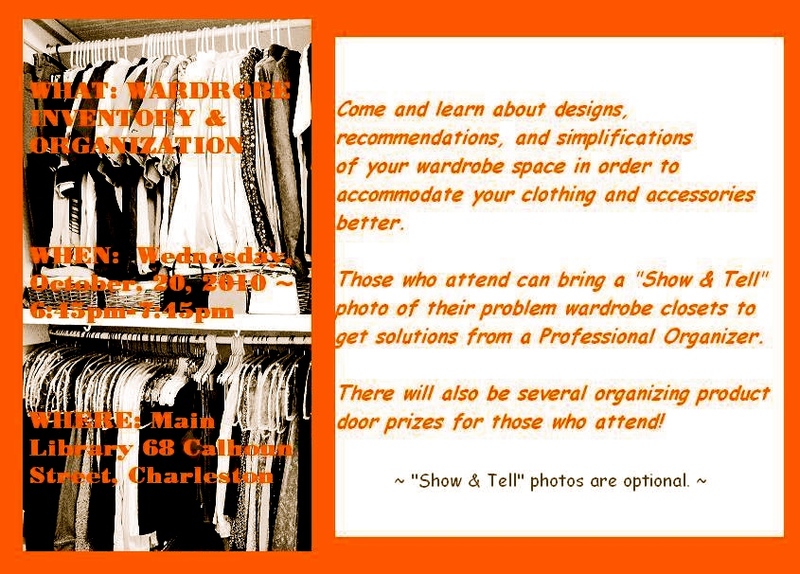 GC007- WARDROBE INVENTORY & ORGANIZATION: For anyone wanting to streamline their wardrobe and/or prepare for a life transition, this program brings logic into what is a very personal project. The program takes into account the pieces of any existing wardrobe for both women and men and uses checklists for staple garments that build the foundation of a complete wardrobe. With advice about appropriate storage and hanging techniques, it becomes easy to learn about how important it is to maintain an organized closet filled with practical essentials while also evaluating accessories and special occasion wear. GC008- READY KIDS: UNDERSTANDING ORGANIZING: [A parent/teacher & child joint participation class!] It’s quite helpful for kids be well organized at home, at school and at any of the many extracurricular activities that they may choose to become involved with. It can be necessary for kids to understand organizing and how it differs from cleaning up a messy room. It is also very important that parents and children realize the many types of organizing and how keeping certain things neat is not meant to squash creativity. As this is a parent and child class, much information will be covered about the importance of being well organized for medical reasons, school preparations and various types of emergencies. This program is suitable for any age group. GC009- NOT QUITE ZERO WASTE – HOME SUSTAINABILITY: STEPS TO A LEADING A HEALTHIER LIFESTYLE: This new four week series is for those considering ways to make their home and lifestyles more sustainable by adopting habits that lower refuge, power and clutter, etc. In this series, attendees will learn about living a healthier, simpler and more peaceful lifestyle while helping the environment. *Note: This is a very complex version of GC016 class description below. 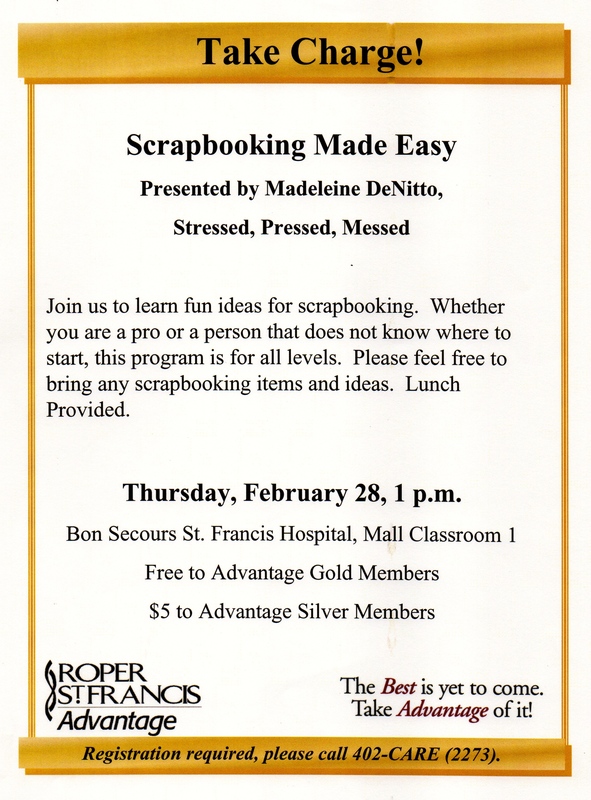 GC010- SCRAPBOOKING: This “Old School Method” of archiving memories goes back to the original formal practices of scrapbooking and touches on the history of the pastime, as well as relating to famous scrapbookers, such as Mark Twain and Thomas Jefferson. This green program is highly focused on recycled materials as opposed to those which are ready made and expensive. GC011- ORGANIZING AND ARCHIVING PHOTOS: With ideas coming from a professional photographer, learn what products will help photos last generation to generation, as well as where restoration services may be an option to consider for photos in need of repair. GC012- KITCHEN AND BATHROOM NIGHTMARES: Dealing with storage nightmares in tight bathroom or kitchen areas are the focus of this program, giving new ideas and product introductions to those living with daily frustrations of cluttered cabinets, pantries and linen closets. GC013- CHALLENGES IN ARCHIVING: From simple items of keepsake to precious family heirlooms, this is the program where one can view the most innovative ideas for parents and grandparents facing the challenges of how to best preserve and archive those special items passing from generation to generation. This program also offers options in what school, art and/or project work to keep without it becoming a burden due to lack of space or hurting the feelings of children. GC014- SENIORS AT HOME CARE: This fairly new program offers special spatial planning and ergonomics for those with newly diagnosed or progressing health issues in which careful attention should be addressed for preventing injuries and avoiding other specific risks while living at home versus under a roof of limited to full assisted living. This program provides thorough outlines as to creating a safe and comfortable life at home. GC015- STAGING TO LIVE! : Learn about concepts relating to how to stage a home completely —indoors and outdoors, either to sell or to live— with guidance on how to lock a home in warmth and comfort indoors and have front curb appeal while the back offers privacy and relaxation. GC016- “GREENGANIZE!” (official GC term) : This program deals with the growing interest in going green, or at least adopting a few healthy habits in helping out the environment with natural methods of cleaning and organizing. *Note: This is a very simplified version of GC009 class description above. GC017- THE UN-REALITY OF REALITY TV: In response to the general public becoming more and more misinformed by the mass media, this program is based on the current issues of various TV channels offering “reality” about organizing in which several of the shows are not as realistic as one would think. This program is designed to state facts and proper procedures to the questions and qualms circling around these misleading programs. 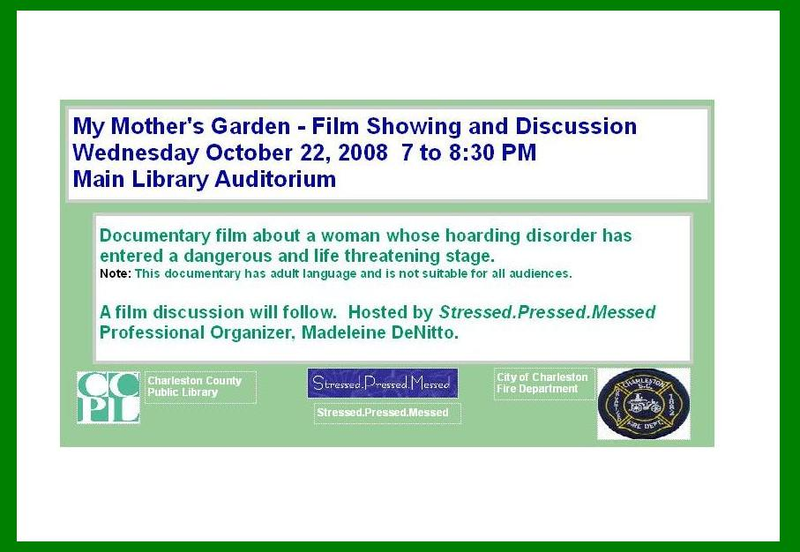 This program educates people about certain risks and myths. GC018- COMFORT ZONES FOR NEW SENIORS: This program focuses specifically on the physical, intellectual and emotional levels of what is a calm and comfortable living style for those reaching retirement age. Learn how simple modifications can make daily routines easier, safer and free of frustration. The program deals with the physical spaces and tangible items within a residence, as well as proper document filing and strategies for emergencies. *Note: This is not the same class as GC028 description below. 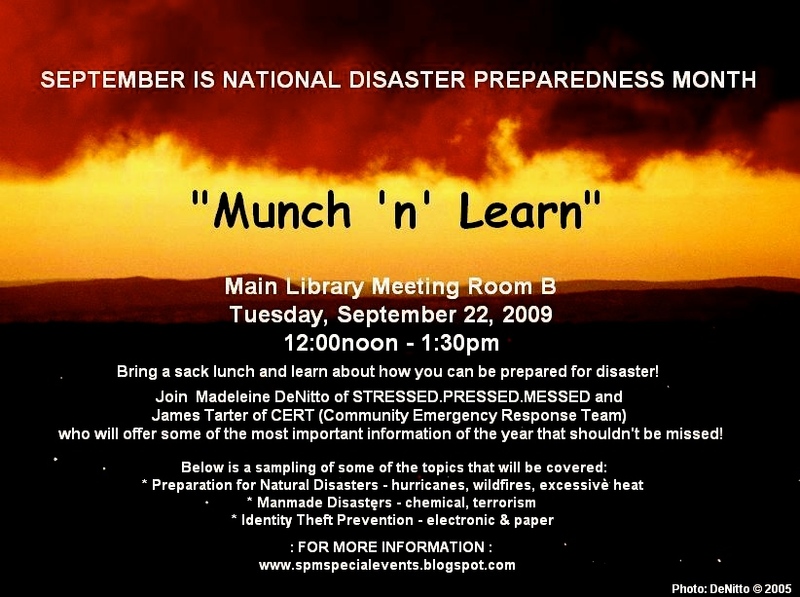 GC019- EMERGENCY & DISASTER PREPAREDNESS: As a program introduced several years ago, this one deals with organizing strategies in becoming prepared for various emergencies, including medical illnesses or injuries, natural disasters, vehicle accidents, inclement weather, etc. Learn what important items to keep stored in specially designated areas for such emergencies and what documents are most necessary to have in possession. 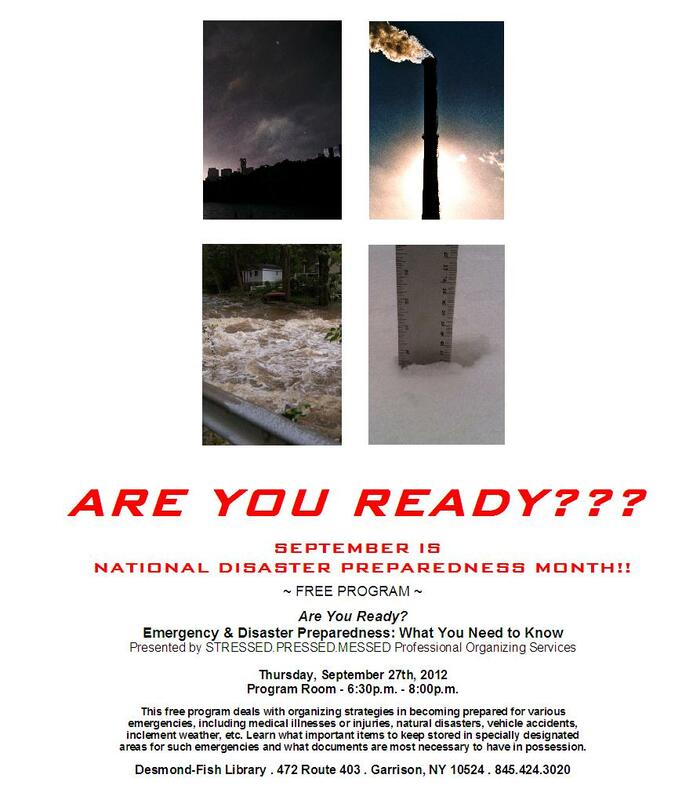 September is National Disaster Preparedness Month! GC020- CLOSETS: THE 101 BASICS: The simplest format for most any closet, including that of wardrobes for men, women or children, kitchen pantries, hall coat closets, attic nooks, linen closets, etc. GC021- STORAGE CHALLENGES: The 101 of storage product introductions for families or individuals. Storage units are also discussed as to when and when not to use them. GC023- COLLECT, CLING & COVET- THE EMOTIONS OF CLUTTER: A brand new program focusing on emotional attachments for material objects. This program offers discussion into the psychological reasoning as to why we collect, cling to and covet material items and touches on when these habits can become unhealthy. GC024- NEW PARENT BASICS: When becoming a new parent, it’s vital to be as organized as possible. With so much to learn and experience while caring for enfants through pre-schoolers, keeping a balance in all daily routines is key. This program focuses on what items to have on hand at all times, what situations to avoid and how to take care of both the child and the parent in order to keep stress levels down to a minimum. There will be full discussions about preparations for expecting a baby all the way through preparing for a child’s first day of pre-school. There will be a lot of information covered about the importance of being well organized for medical reasons, school preparations and various types of emergencies. GC025- WORKSPACES- HOW TO KEEP OFFICES & STUDIOS INSPIRING, YET ACCESSIBLE: This program is geared to those who feel like they may be losing ability to stay on top of deadlines due to clutter accumulation, lack of systems to store supplies and/or files and the feeling that the space meant for work is not inspiring and perhaps draining creative energy. If a workspace is keeping one from being productive, it can bring on frustration and cause many delays in completing projects. This program can help give a facelift to a space with tips, product examples and spatial planning ideas. *NEW! – GC027 – ORGANIZING BOOTCAMP: JOIN THE ACADEMY FOR “NO-MORE-EXCUSES” ORGANIZING: This intense workshop will lead attendees through a rigid process of what is mort important verses what is least important in order to make major changes in their lifestyle as quickly as possible. In dealing with clutter, attendees will learn how to handle certain tasks immediately with determination to meet personal deadlines and ultimate goals. 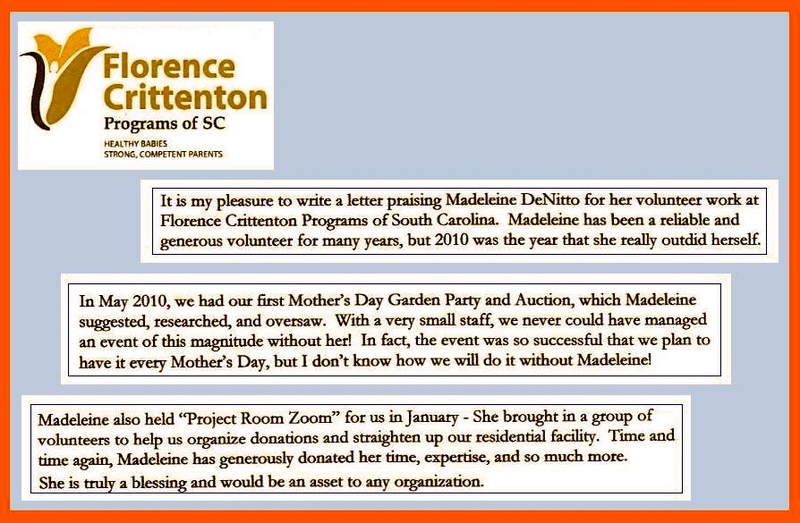 Unlike other classes about organizing that Madeleine also offers, this workshop is rather strict and helps those who find themselves with a loaded mind of determination to finally accomplish tasks that they can no longer stomach. *NEW! – GC028 – AGE-IN-PLACE: HOW TO ORGANIZE A RESIDENCE FOR SENIORS TO SAFELY REMAIN IN THEIR OWN RESIDENCE: Many seniors prefer to remain in their own homres to live our their lives. There are ways to extend independent lifestyles at home by inspecting a residence room by room to ensure the stability of the structure, to assess the amount of clutter and to install helpful devices and railings, etc. This four week program will address multiple changes that can be made for a residence, enabling seniors to feel more secure and happy to remain in their space for as long as possible. 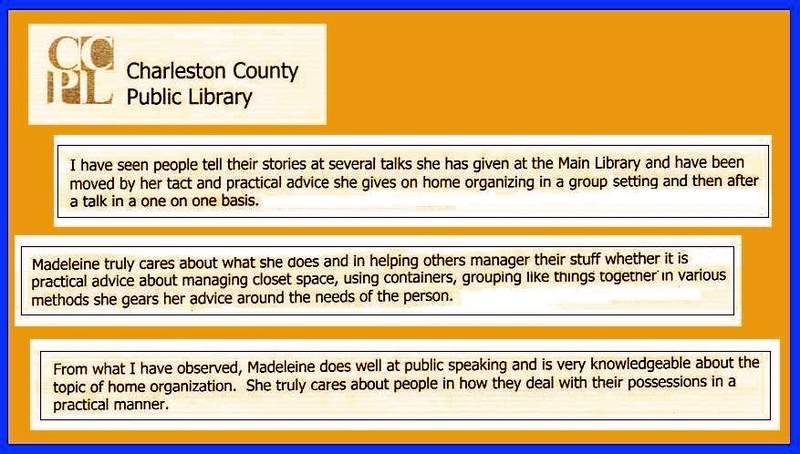 Both seniors and their adult children can gain helpful information from this class. **Note: This is not the same class as GC018 description above. GC029 – ORGANIZING FOR THE PERIOD HOME: A popular topic for those living in a historic location, this program was created for those wanting to consider more space in their current period home or wanting to purchase a period home, but holding off on such a purchase due to lack of insight as to a remedy for the low or non-existent storage as viewed in a recent home on the market. This program focuses on how not to detract from any architectural features of a home by adding storage that is hidden or by using items that are considered part of the decor. *NEW! – GC030 – CHAOTIC INHERITANCE: HOW TO DEAL WITH OR AVOID DIFFICULT CHALLENGES FOLLOWING THE PASSING OF A LOVED ONE: A subject we all wish we didn’t have to address and prepare for. This special program discusses preparing well in advance of an inevitable passing, as well as learning what to expect if choosing Hospice care and dealing with the many tasks following a death. There is a lot of focus on how to avoid leaving chaos to survivors, such as excessive clutter, financial or legal issues or surprises of possessions or property unknown to have been owned. The program strongly recommends steps to planning departure with a will, burial insurance and inheritance lists to prevent any bickering and frustrations. CONTACT : e-mail or 917.536.2033 for scheduling.